Hilson and Porter, 2019 Diversity, Equity and Student Success Conference. Congratulations Drs. 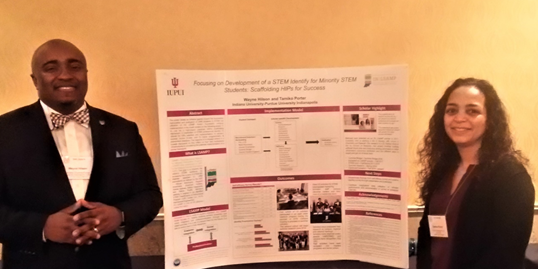 Wayne Hilson and Tamiko Porter on your presentation, Focusing on Development of a STEM Identity for Minority STEM Students: Scaffolding HIPs for Success, during the 2019 Diversity, Equity, and Student Success Conference focused on Engaged Inclusivity: Perceptions, Realities, and Aspirations. The conference provided an opportunity to disseminate research from IN LSAMP IUPUI program and meet with colleagues and professionals from around the nation to discuss what it means to work towards a campus environment where inclusivity thrives through constant reflection, analysis, and accountability. Dr. Hilson detailed the importance of attending professional conferences as an opportunity to learn about new ideas and constructs, evaluate best practices and their viability at one’s own institution, as well as expand one’s professional network. He plans to return to IUPUI and continue to work with local colleagues to delve deeper into novel ways to assess the impact of our program, particularly at the intersections of difference (i.e. race & gender). He returned to campus energized and with ideas to support student success! I look forward to using the more expansive ways one can think about student success that I learned at the conference.